*Question: "How do I deal with criticism for being vegan?" *Question: "How do I find vegan medication?" 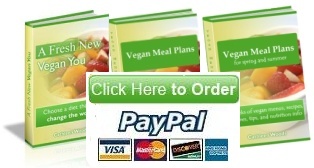 *Vegan Ebooks: NEW! Guide to Cooking Beans and Grains: Soak, Rinse, Boil! Remember, I write this newsletter and maintain Vegan-Nutritionista to help you, so if you ever have a suggestion for a topic you want covered in the newsletter, please let me know. Have a friend who might like to read this? I really hope you enjoy reading this newsletter and that my website is helping you to be the best you can be. If you think your friends might be interested in taking a look, please do me a huge favor and forward this email to them. Last month we took a long weekend vacation at a cool mountain resort that had a huge organic garden and working farm. The garden makes enough vegetables for the resort to use them for all their meals throughout the summer months, and they even pickle and can their own leftovers. It's always interesting to see small farms in action, and though we don't believe in taking the milk from the cows to feed humans or the eggs from the chickens, we love seeing the animals. So, we're always conflicted at places like this. While they do nowhere near the harm that large factory farms do, they still exploit animals. Ultimately, it’s just fun to learn more about the animal kingdom. I personally like to get up and personal with the animals and leave feeling more connected. My husband likes to walk around and exclaim loudly to me about how we don't eat animals. This farm had a few cows, goats, chickens, ponies, and turkeys, which made for a perfect spotlight for this month's issue of Vegan Bytes. I was feeding goats and turned around and a turkey popped over to me and pecked right at my palm. They are feisty little animals! Turkeys are sociable animals with the same individual personalities of dogs and cats who enjoy chirping and singing along to music, and are, of course, capable of suffering. The turkeys on this farm were nothing like the ones most people eat for Thanksgiving as those are unable to stand up because of how big their breasts are grown with hormones, have broken limbs, sit in excrement, can't flap their wings, and never stretch their legs. Thanksgiving turkeys are killed in a horrible way; their throats are slit while they're conscious and then they're dunked in a boiling tank, many still alive and aware. I couldn't help but think about how nice it is to be able to look an animal in the eye and know that you would never do it harm. If you're reading this newsletter, chances are good that you can also say you're saving a life this Thanksgiving, and cheers to you for that! We’ve got a great collection of vegan Thanksgiving recipes on Vegan Nutritionista, and we'd love to add to it with your favorite holiday recipes, so feel free to share. 3. Dandies vegan marshmallows. There's nothing like these marshmallows on the market right now. They brown and melt just like real marshmallows, and they are light and fluffy just like childhood memories. And, we’ve got a coupon for Vegan Essentials this month! Use coupon code: veg100 to get 10% of your purchase. 6. When I saw this Turkey Cake Pan on Martha Stewart's show, I couldn't think of anything funnier than a turkey shaped seitan roast! Hilarious! 7. ThisPumpkin Pan Set comes from the same idea. It would make a fun seitan roast or casserole dish, or a nice pumpkin-shaped cake. 8. These Mini Leaf and Pumpkin Mold >would be perfect for tiny pumpkin cakes or even as ice cubes for dinner. 9. If you don’t want to bake all your pies, check out this vegan pumpkin pie, ready to bake and enjoy! 10. A seitan roast. If you don’t like Tofurky, try Field Roast’s stuffed roast. Consider adopting a turkey from Farm Sanctuary. 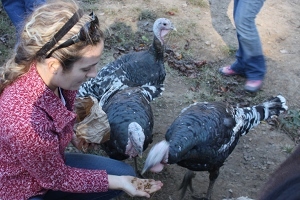 You get to hand select a cute turkey and your donation goes straight to helping the sanctuary run. We've also extended our contest this month! Bello Iris, a vegan online store, is offering up a matching handbag and wallet for our winner, and now we have another cool prize from Tasty Bite... they will be giving a spread of different packs of their vegan line of ethnic dishes to a randomly chosen winner! To enter the giveaway, all you need to do is upload your favorite vegan recipe in our forum. Brag away about that stunner that shocks the non-vegans, and enter as many times as you like. You can also enter your favorite Thanksgiving recipe and we can add it to that growing page. One of the things you search for most on Vegan Nutritionista is quality vegan bread recipes, so I've finally answered the call with a new ebook dedicated to all kinds of bread recipes. This is a big project, but I think you're going to love it. The launch date for Vegan Bread Recipes is scheduled for the December edition of the newsletter, just in time for the holidays. Thank you so much to our amazing recipe testers for helping to move this process along. Apple cider vinegar has long been touted for its health benefits and usefulness all around the house. While it can be used to clean soap scum and tough stains, it also does wonders inside your body. Apple cider vinegar (ACV) is full of potassium, calcium, acetic acid, malic acid, pectin, and ash, and it helps to regulate blood pressure, reduce bad cholesterol, digest foods, break down fats in the body, and give you strong teeth, bones, hair, maintain proper pH balance in your body, and a strong immune system. It also has anti-bacterial, anti-viral, and anti-fungal properties. ACV has been found to improve bowel movements, reduce acne, remove warts, reduce joint stiffness and pain, improve heartburn, sinus infections, flu, chronic fatigue, arthritis, dermatitis, acid reflux, sore throats, gout, candida, allergies, and more. and it’s even good for your pets’ skin/fur and flea control. I definitely recommend Bragg's raw, organic, unpasteurized apple cider vinegar with the mother. “The mother” is the sediment that rests at the bottom of the jar, and when shaken it floats around in the bottle. This is where all the healthful enzymes are, and if you use filtered vinegar, you are missing out on the health benefits of apple cider vinegar. ACV is your friend when it comes to veganizing recipes as well. To make one cup of vegan "buttermilk," simply combine one cup nondairy milk with 1-2 tablespoons ACV. Stir and let it sit for about 5 minutes, until the milk is curdled. You can also make salad dressing by mixing 1 part vinegar to 2-3 parts oil, and adding in any spices you like. If you have any undesirable warts, skin tags, or other benign (check with your doctor first) moles, rather than having the doctor freeze them off, you can take them off with ACV. I recommend using a circular bandaid and cutting a hole the size of your wart out of the middle. Place that bandaid on top of your wart and then put a small piece of cotton dipped in AVC on top of the wart. Cover the entire thing with a bandaid and switch out the cotton every 12 hours or so. Do this for three days tops. You will start to notice the mole turning black, scabbing up, and then it will fall off. It’s really important to cover the non-wart area of your skin with another bandaid because the AVC will take the top layer of skin off of your good skin if you do not. If you’re trying to remove something off your face, you can keep the bandaid on only at night, but keep in mind that the wart will appear bigger and turn black, so you might be self-conscious. Maybe try it on a weekend! There are also a plethora of books on the health benefits of apple cider vinegar and some amazing ways to use it in your life, like this one called Apple Cider Vinegar: Miracle Health System. My new favorite way to drink apple cider vinegar is through a grape concoction that Bragg’s sells called Bragg Organic Apple Cider Vinegar All Natural Drink Concord Grape Acai. I was drawn to the bottle because I knew how good apple cider vinegar is for you, and I also know concord grape juice has tons of health benefits. When I first tried it, it was zingy and interesting, but the more I drank, the less I could remember why anyone would ever want to drink regular sweet grape juice again. The depth of flavor is so much more interesting than the flat sweetness of grape juice. So, I went home and doctored up my own recipe for it. If you make my recipe exactly as is, it will be slightly different than Bragg’s drink, and slightly more vinegary. I really like it this way. Luckily, as with every recipe you make, you get to control the flavors, so feel free to pour more or less of each ingredient into your own juice. Combine all the ingredients and stir well. It tastes best cold, so give it some time to refrigerate. 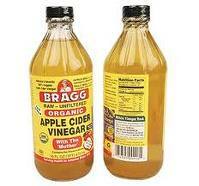 You can buy Bragg's Apple Cider Vinegar at Amazon for a discount over what you find in stores. Also, if you’re going to use it relatively often, it makes sense to buy the larger bottles. "How do I deal with criticism for being vegan?" My husband and I met some new people. My husband is a tattoo artist, and we went to their home so he could do tattoos for our new friends. These are BIG TIME meat-eaters. The man is about 350 pounds, his wife about 250. Their preteen kids are closing in on 200 pounds each. Big people, BIG meat eaters. Naturally, they wanted to feed us dinner. My very supportive, very sweet husband told these people in advance that I was a vegan. He told them not to worry, just serve a salad with dinner. My husband has seen me have to eat when I get home from many events. Well, these new friends of ours did not know what vegan meant. They bought TONS of "vegetarian" food for me... not vegan. They went to the trouble of buying and cooking Mac and cheese, chips and creamy dips, cheese balls and crackers. UGH. I felt AWFUL. I ate a couple bites of each. About 2 hours later, I had to RUN to the bathroom. No one noticed I was sick, besides me. My body wasn't used to all that dairy. It was ugly. Anyway, we went back today. My husband had to finish a tattoo that started on the "mac and cheese day". Well...they had cooked up a POT of Italian Beef! They asked me if I was okay with a beef sandwich. I told them "NO." The man rolled his eyes, and said "Oh, get over yourself!" See what I advised Stacey to do, and offer advice of your own. Question: How do I find vegan medication?" Great question! To start, congratulations on changing your lifestyle this year, and I'm so glad you're reaping one of the huge benefits of veganism-- rarely getting common illnesses. I'm glad you're planning ahead for a time when you might need a vegan medication. A lot is going to depend on your doctor and his/her awareness of veganism, as well as openness to helping you follow your lifestyle. Not all doctors are going to be completely aware of what exact ingredients are in the medications they prescribe. But, you should definitely ask him/her. You could also bring a list of non-vegan ingredients that you are looking to avoid and ask the doctor for his/her help in finding a vegan medication that is suitable for you. The other issue you are going to deal with is medicines that are tested on animals. To find the full answer to how to find vegan medications, read the full article here. Have unresolved questions about veganism? Join in the discussion on our site by asking and answering questions, as well as commenting on other answers. It's fun and helpful! Soak, Rinse, Boil! is a complete guide to cooking beans and grains. Don't worry about picking up endless cans of beans that need to be rinsed to reduce the sodium. Control all your own additives with fresh, homemade beans and grains. This guide teaches how to soak, how to boil, what spices to add and when, and how to store your finished product. Download a copy for only $4.75 here. *Note* If you are an owner of A Fresh New Vegan You, you have a very similar guide in your ebook already. This is a printable handbook to store in the kitchen near your dried beans and grains. The spring meal plan book is available and is getting great reviews! It focuses on seasonal spring vegetables like kale, lettuce, carrots, peas, strawberries, tomatoes, peppers, and more! Just like in the original Vegan Nutritionista meal plans, the menus include 66 recipes for full dinners for 4 work weeks complete with nutritional information, tips, and many pictures. No repeats! 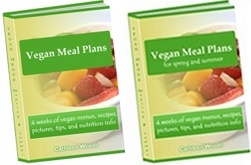 Get your Vegan Meal Plan for Spring/Summer, now for just $9.75. A Fresh New Vegan You is a complete look at why people go vegan, including information about factory farms, the environment, and the health benefits. It provides details on how to go vegan, and offers basic vegan nutritional advice, as well as information on vegan pregnancy and raising vegan children. 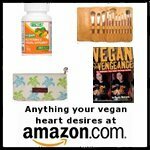 This ebook combines all my vegan research into one easy, convenient location. Download a copy for only $27 here. Get A Fresh New Vegan You and Vegan Meal Plans with a free copy of the massive Vegan Grocery List for only $33. Save 10%! Download this package here. Get A Fresh New Vegan You, Vegan Meal Plans and Vegan Meal Plans for Spring with a free copy of the massive Vegan Grocery List for only $39.75. Save 15%! Download this package here. *Note: this does not include Soak, Rinse, Boil! because you it is in A Fresh New Vegan You. Contest for a Bello Iris Vegan Purse and Wallet Combo and Tasty Bite Samples-- Enter Now! Calling all vegans who like to cook!! The best vegan recipe and writeup wins this fabulous bag and matching wallet from Bello Iris, where fashion meets compassion. Don't miss your chance to win just because your forget to upload your recipe... enter now! *Only submissions with both a picture and a recipe will be eligible for the prizes. *Your submission must be original and cannot be copied from another source. *Submit as many easy vegan recipes as you like! You may also submit recipes on other pages such as vegan cake pictures here and thanksgiving recipesand those will also count for the contest! *You could also submit a video of you preparing your recipe. Have fun with this! *Each vegan recipe picture must be a dish that you or a family member MADE (not purchased). *Your recipes DON'T need to be perfectly sculpted or look professional. Recipe creativity, your write-ups/explanation, photo composition, etc. are no less important than "looks". *Explain how you prepared the recipe, where the idea came from, a few tips that'll help make it easier for others to prepare it themselves, where to find the vegan ingredients, write up the recipe, or provide any other information you'd like to share. Your write-ups are REALLY important and they must be at least 300 words to be considered for the drawing! My sister's neighbor Anna came up with this idea for butternut squash, and it's fabulous. Maggie described it as "melt-in-your-mouth," so that's a pretty great recommendation. It's easy and perfect for this time of year when you've already roasted, pureed, and souped tons of butternut squash. Anna's recipe will be entered into the drawing to win the Bello Iris handbag or the Tasty Bite samples. Thanks, Anna! Cut away peel & seeds from squash and then cut into approximately 1-inch cubes. In a large bowl combine the squash, bell peppers, oil, pressed garlic, rosemary, salt and black pepper. Transfer to a 2 to 2-1/2 quart shallow baking dish. Bake in middle of oven until squash is tender and top is golden, 50 - 60 minutes. And don't forget, a percentage of all Vegan Nutritionista profits go to a rotating group of charities that benefit animals. Last quarter, we donated to Vegan Outreach. What's New at Vegan Nutritionista?